As a freshman at Mizzou four years ago, Julia Brose knew she had a love for plants. That, however, competed with her fascination with biochemistry. Luckily, she found and was selected for FRIPS, Freshman Research in Plant Sciences, which allowed her to do both. The program is made up of 10 freshman each year who gain valuable hands-on research experience with plants. 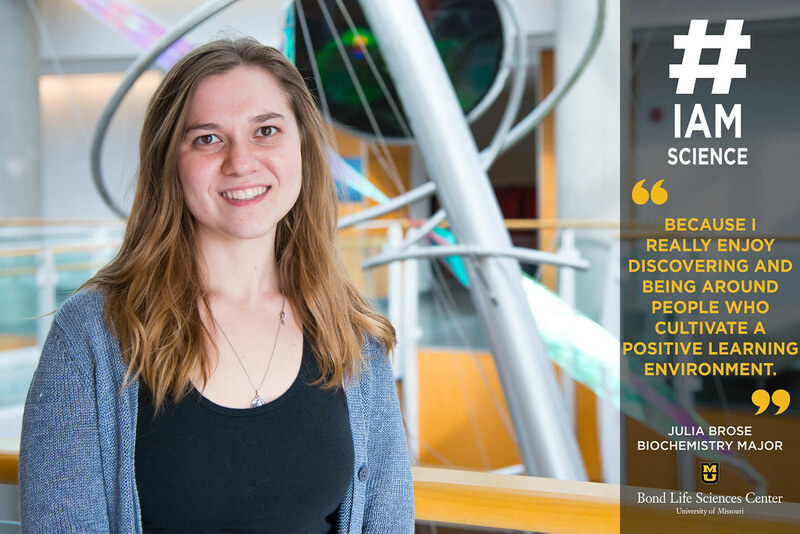 Her degree in biochemistry coupled with her research experience has given her a number of unique opportunities. One of which was being a Cherng Summer Scholar at Bond LSC last summer where she studied plants and their protein makeup. Another unique opportunity Brose earned was in summer of 2016. She worked at Stanford University as part of a fellowship for the American Society of Plant Biologists. Her background in biochemistry and her experience with plant research at Bond LSC in Chris Pires’ lab provided her with the ability to analyze the defense structures in a unique way. As a result, she uncovered something that others had either ignored or overlooked. Her work at Stanford led them to send her to a conference in Hawaii earlier this year. While there, Brose was able to present a poster on her findings as well as network with a number of successful scientists in a variety of fields. As she nears graduation this spring, Brose has begun looking into graduate school options. Those are largely based upon the experience she had in Hawaii. “I was able to make connections that have influenced my plans for the future as far as where I’m applying to graduate school,” Brose said. Wherever she ends up, Brose hopes to teach.